I've never had much to do with the Forty Hours devotion in the past, so this was a learning experience for me. 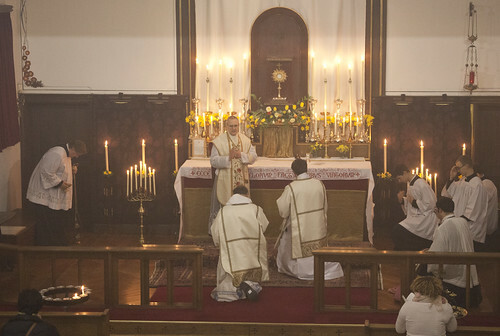 It is a wonderful devotion, a great way to bring the Blessed Sacrament and the Mass into a petition for something really important, that the whole community can be involved in. 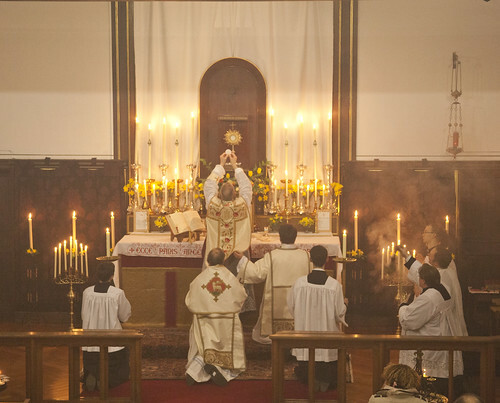 From a liturgical point of view, the final Mass of the 40 Hours involves Mass in the Presence of the Blessed Sacrament exposed. 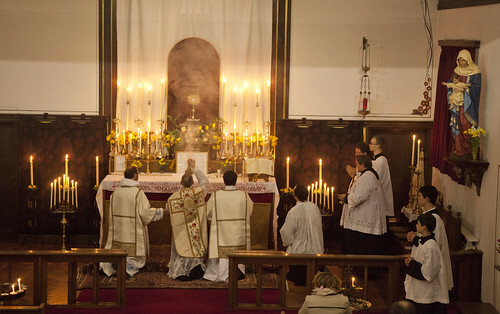 After Mass we sing the Litany of the Saints, have a procession with the Blessed Sacrament, and then (the second half of) Benediction. 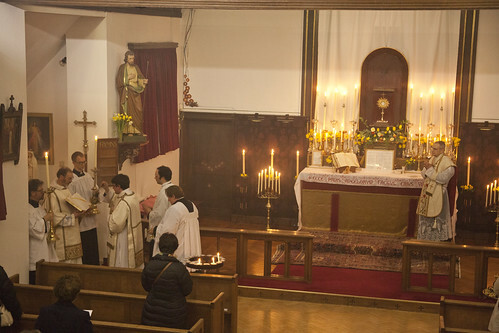 Solemn Mass was celebrated by Fr John Saward (this is his church, SS Gregory & Augustine's, in Oxford), with Fr Daniel Lloyd as deacon and Fr Richard Conrad OP subdeacon. 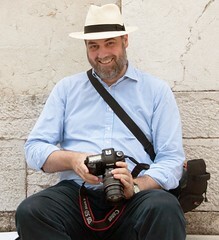 It was accompanied by members of the Schola Abelis led by two Dominicans, and a small polyphonic group as well. It was a truly splendid occasion. 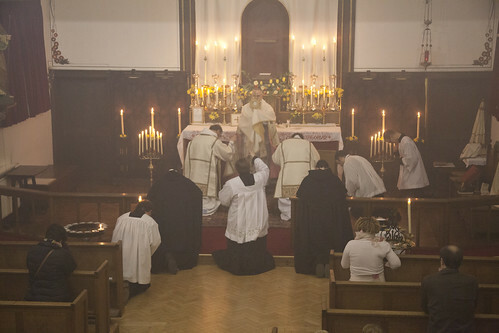 The celebrant doesn't just incense the Crucifix as usual, but kneels to incense the exposed Blessed Sacrament. 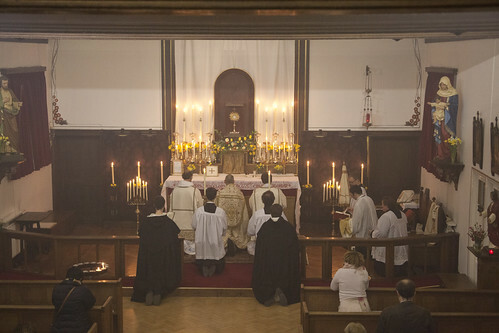 The Litany of the Saints, led by two Dominicans. 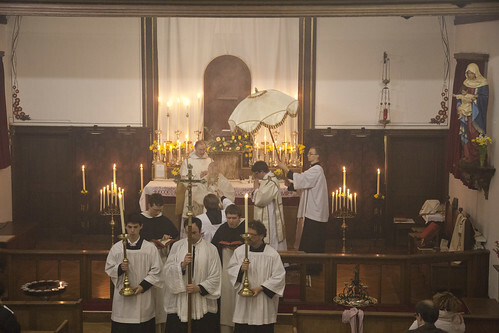 Procession with the Blessed Sacrament.